While Valentine’s Day isn’t a huge deal at our house, it does give me a reason to bake up something extra special…usually involving chocolate. Warm Chocolate Pudding Cakes are definitely something special. They are a simple yet decadent dessert that is pure comfort food. They are also surprisingly quick and easy to make and can even be made a day in advance (great for entertaining!). The recipe can easily be halved to serve only two, OR make the full recipe and enjoy one set of cakes one day and enjoy them again the next day. Warm Chocolate Pudding Cakes are delicious as-is, or topped with your favorite ice cream. I had vanilla bean on hand, which was classic and tasty, but I am drooling over the idea of a salted caramel ice cream topping these cakes. Since I made the full recipe for the two of us, we got to enjoy Warm Chocolate Pudding Cakes two nights in a row. I’m pretty sure Valentine’s Day is going to become one of our favorite holidays now, if it means special desserts like this! In a double boiler (or a mixing bowl placed over simmering water), melt chocolate and butter, stirring occasionally. Once melted, remove from heat and mix in 2 tablespoons sugar and then egg yolks and vanilla, stirring until until combined. Set aside. Bake for 15 to 20 minutes, or until the cakes puff up and the tops begin to crack. Be careful not to over bake. A toothpick inserted in the center should come out gooey. Serve warm or at room temperature, topped with ice cream, if desired. Now I always strive to share healthier recipes with you, but when I saw Marshmallow-Topped Chocolate Pudding Cakes in the latest issue of All You, I could not resist. Chocolate pudding cake is enough to make me swoon, but add a melty toasted marshmallow on top…are you kidding me? Must make pronto! Fortunately I had everything on hand, and it all seemed easy enough. I have 7-ounce ramekins instead of 6-ounce per the original recipe, but figured that wouldn’t be a big deal. Then I decided it was necessary to test the make-ahead capability of this recipe. Let’s just say when I told Mike that we would be having pudding cakes with a marshmallow on top two days in a row, there was very little arm-twisting involved. To be honest, I cannot remember what we had for dinner that night, what I did the next day or anything in between, but I do remember every single little bite of these pudding cakes. The chocolate is perfectly dark and decadant. The marshmallow oozes and provides a nice sweetness to complement the chocolate. Plus, they’re cute. For a special occasion, such as Valentine’s Day, or any celebratory occasion, Marshmallow-Topped Chocolate Pudding Cakes will rock your world. Perfect to make-ahead for guests, for yourselves, for whatever reason suits you. Preheat oven to 375 degrees. Spray 4 6-ounce (or 7-ounce) ramekins with cooking spray and place on a baking sheet. Set aside. Put butter and chocolate in a large, microwave-safe bowl. Microwave on high until almost melted (about 1 to 2 minutes). Stir until smooth. Mix in flour and set aside to cool. With an electric mixer (hand or stand) on medium-high, beat sugar, eggs, vanilla and salt for about 5 minutes, until smooth and frothy. Fold in chocolate mixture. Divide batter among ramekins. Bake until cakes have risen and cracked on top but wet in center (12 to 15 minutes). Do not overbake. Press a marshmallow in the top of the cake. Set your oven to broil and broil cakes until marshmallow is puffy and starts to brown (keep an eye on it, but about 2 minutes). Put on wire rack to cool for 5 minutes before serving. Cakes can be made ahead through step 3 and stored (covered) in the refrigerator for up to 2 days. Baking time does not need to be adjusted, just keep an eye on the cakes. In anticipation of Valentine’s Day, I will be featuring a few chocolate recipes this week. Of course a little breakfast chocolate is the perfect way to start off any week. 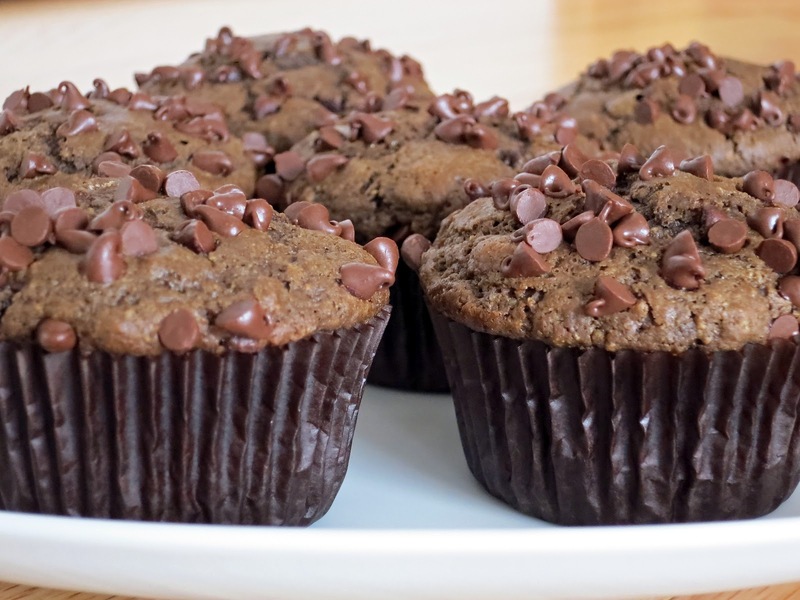 These muffins are more than just a little breakfast chocolate though. They are chocolate on chocolate. 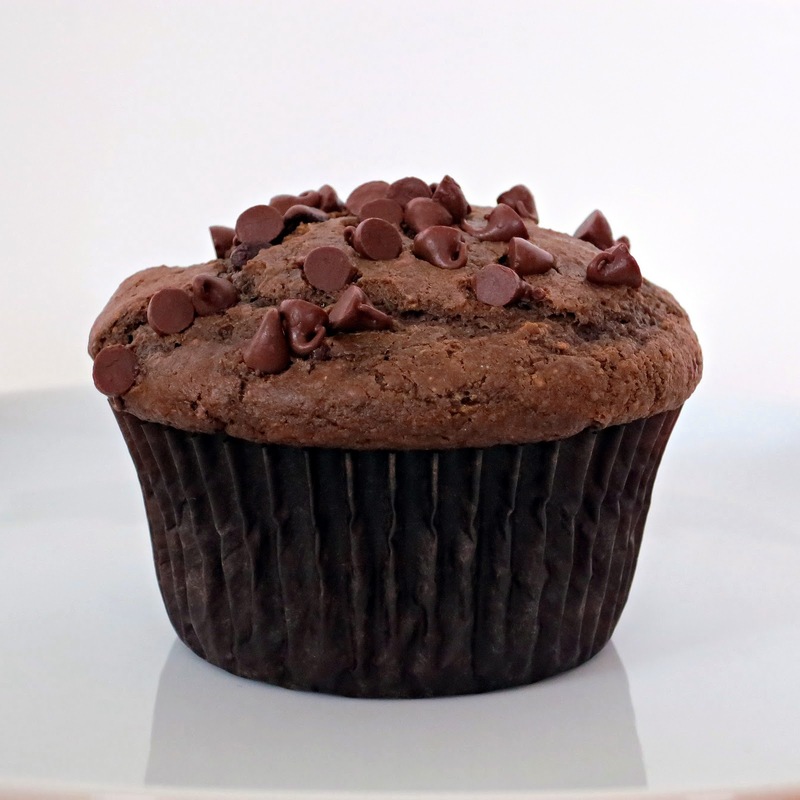 A chocolate muffin studded with chocolate chips topped with chocolate chips. What could be better? Well, they come in under 200 calories and are low fat – a true breakfast treat! The original recipe uses red wine vinegar and water, which I thought was intriguing. Red wine vinegar in baked goods? I had to try it! I did, and it was good. BUT…I have since revised the recipe to replace the vinegar/water with buttermilk. Nothing compares to the flavor and texture that buttermilk gives to baked goods, and in these muffins that is no exception. I also replaced some of the all-purpose flour with whole wheat in order to bump up the nutrition level a bit. For a little variety, it is fun to change up the chips with different flavors (peanut butter chips anyone?) but I always find myself coming back to the mini chocolate chips. Mini chips give the illusion of more chocolate per bite since there are more bits throughout. A little more for less kind of thing. Preheat oven to 400 degrees. Line 12 muffin cups with paper liners (or spray muffin tin with cooking spray). In a large bowl, mix flours, sugar, cocoa, baking powder, baking soda, and salt. In a medium bowl, whisk together the buttermilk, oil, vanilla and egg. Stir in 1/4 cup chocolate chips. Add buttermilk mixture to flour mixture, gently folding until just combined. 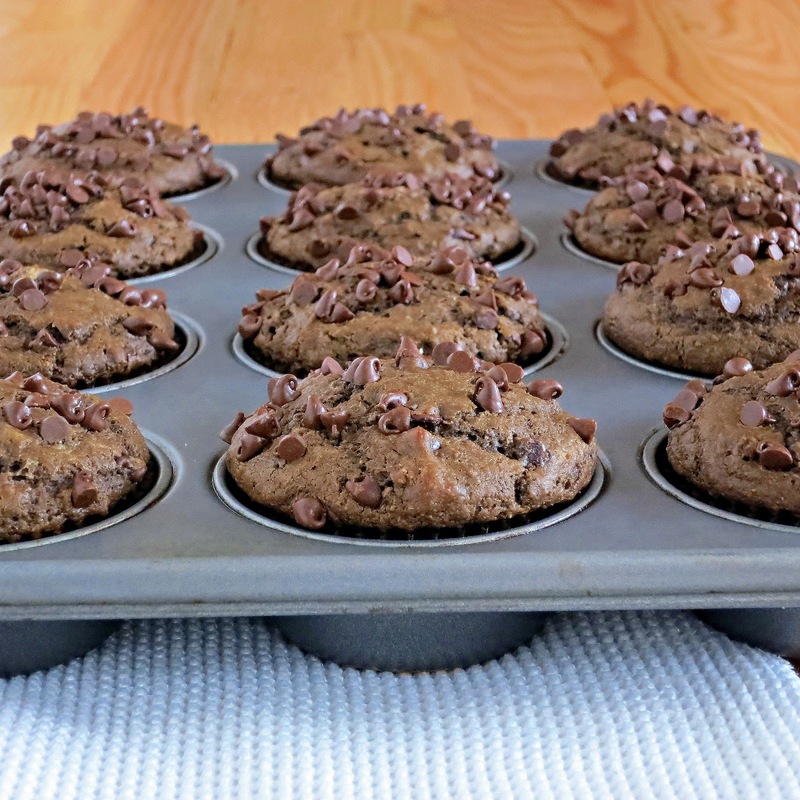 Divide batter evenly among 12 muffin cups. Sprinkle tops with remaning 1/4 cup mini chocolate chips. Bake for 15 minutes, or until a toothpick inserted in the center comes out clean. Let cool in pan for 5 minutes and then move to a wire rack to cool completely.